Blog A year of taking Recharge - what's changed? 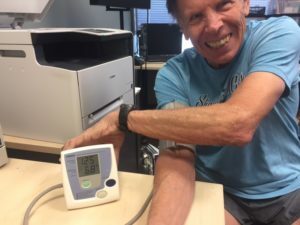 Today, I had the pleasure of running biomarker tests on Doug Malewicki, the extreme sports enthusiast, aerospace engineer, inventor, and writer who had the dramatic improvement in his pulse pressure from baseline to two months of Recharge use that I blogged about here. At the age of 78, he is more active than ever, being by far the fittest person at his recent 60th high school reunion in Chicago. The actuarial data for 78 year old Americans shows his class size of 234 statistically would have only about 145 still alive (62%) – let alone fit and active. Doug estimates that only about 124 of 224 remain in the South Shore High School class of 1957. His mind remains active and he has just written a new book this year about how to use the panoramic setting on smart phones to take clone pictures of yourself. 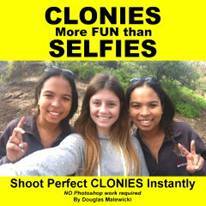 It’s called Clonies- More fun than Selfies ~ and you can purchae it now on Amazon. 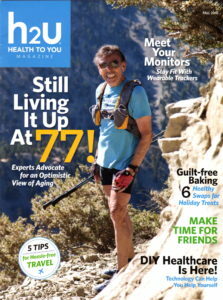 Physically, in the last 12 months he states he enjoys peak performance, running 78 miles for his 78th birthday (over three days), trekking up to base camp at Mount Everest, and is planning another run up Mount Baldy this weekend. With regard to his biomarker tests, his improvements are largely around his skin elasticity which improved 50% (from 25% to 47%). His lung function after initially dropping at 2 months has returned to baseline. His vision is unchanged. His pulse pressure (systolic minus diastolic) went from 59 to 54 and back to 59 but with an Augmentation pressure (or implied stiffness of arteries) that is much improved at 17mmHg (down from 22mmHg). Finally, his cardiac perfusion efficiency, or SEVR is a very respectable 196% (down from 218%). The real question is what would have happened if his clone had not taken Recharge for a year. Would he be closer to using a walker? Would he still be inviting me out to wine and Sci-Fi movies? This is the A/B testing that we will never have as I discussed in this blog. I received a question from a friend tonight about whether his 85yo mom should increase her dosage. I had to be careful because it depends on several practical considerations. When we accelerate the turnover from apoptosis as with this man taking 8 TA-65 and getting a sore Achilles’ tendon, we can assume that there will be increased demand upon the stem cells. So what is the quality of an 85yo woman’s stem cells and how many can she afford to recruit? 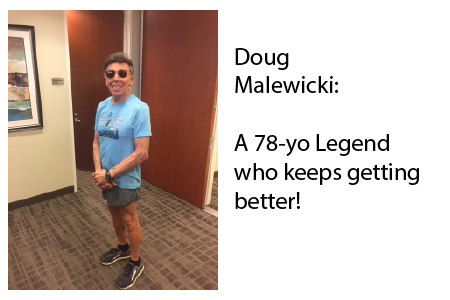 In the case of Doug, I know his constant exercise implies that his stem cells are happily being used at a high rate with good functionality. So I easily recommended he increase his dosing to 2 capsules daily. Since I don’t know my friend’s mom, I would have to be more cautious. Addendum: There has been some buzz about a recent study showing “9 years” of additional telomere length from strenuous exercise. This study of nearly 6,000 people found a 140 base pair advantage which is conservatively 1-3 years. Nevertheless, there are many studies linking exercise to longer telomeres so the basic idea seems valid.